Yea, though we take a quick nip through the valley of the shadow of death, we shall fear no boredom. There’s plenty of life in the subject, as evidenced by the increasing number of art books published with this focus. Long a favourite subject in the self-help and philosophy genres, books on death, dying and disease are now pushing up like daisies in the artistic fields – beautiful volumes on funerary practices, explorations of blinged-out catacombs, and illustrated compendia of disease. 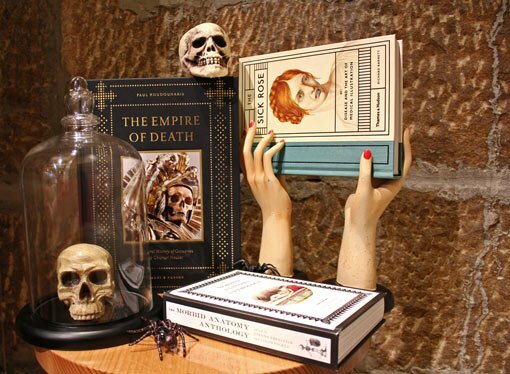 Some – like Paul Koudounaris’s Empire of the dead and Heavenly bodies – examine the worlds of charnel houses, ossuaries, and saintly skeletons adorned with precious jewels. The intricate artworks and interior decorations created with human bones are beautiful and unsettling, not least because they may give you inspiration for home craft projects. The sick rose by Richard Barnett is a collection of medical illustrations, showing detailed anatomical drawings and diagnostic aids from before the age of colour photography. Compare the ‘before’ and ‘after’ portraits of patients with cholera and typhoid; admire the precise rendering of pustules and putrefaction. While these illustrations were produced for the medical professional, not the layperson, they may put the contemporary reader very much in mind of the current practice of self-diagnosis following a consultation with Dr Google. The Morbid anatomy anthology brings together a range of peculiarities around death, medical history, religion and ritual, developed from the program of events held by the Morbid Anatomy Library in Brooklyn, New York. Both macabre and matter-of-fact, there are essays by 28 authors with extraordinary accompanying images. Skull art, Victorian post-mortem photography, taxidermied humans, coffinalia, death cabaret – an intriguing collection of the taboos and transformations related to the body, occupied and otherwise. The resurgence in popularity of these subjects seems to point to a re-embracing of death as a subject not to be shied away from. While there are plenty of gleefully ghoulish thrills in the boneyards and mortuary stories, there is also serious beauty and genuine terror in these approaches to death, disease and the nature of mortality. Now if you’ll excuse me, I have to go and amend my will. I haven’t been nearly specific enough about how many diamantes I am going to require someone to glue to my corpse.